**Product Information** - REAL Design Inc.
Every step of a child's development leads them closer to independence. Through movement, a child explores, interacts with, and learns about the world around them. The new By-Myself System™ from R.E.A.L. Design™ was developed to aid children with motor disabilities in the aquisition of skills for independent movement. Pediatric Therapists working in schools, centers, and homes will find the By Myself Line™ of equipment a valuable tool for assisting children with motor development goals. Children will enjoy the playful quality of the colorful, durable components while they learn skills such as balance and coordination, transition from sit to stand, and walking. • The Lift- Off Chair™ with a padded adjustable seat wide enough to provide a stable base of support for children learning sitting skills. 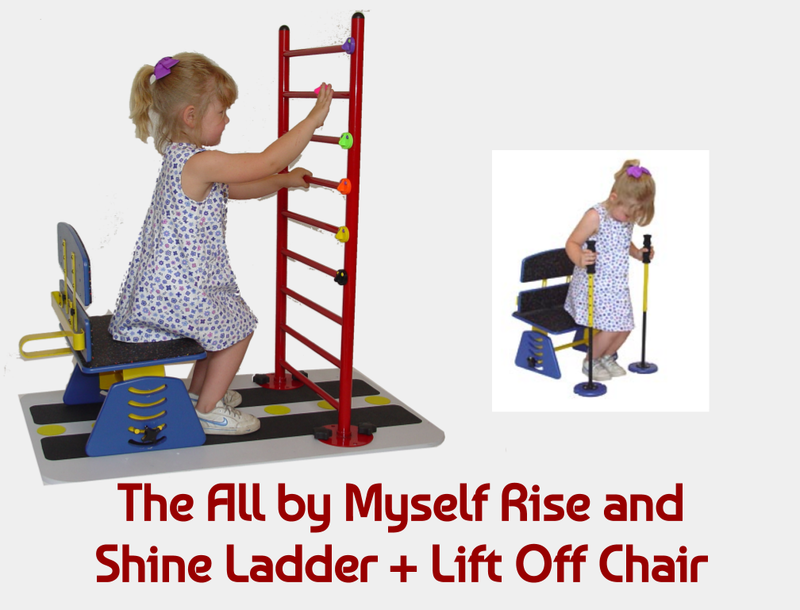 • The Rise and Shine Ladder™, constructed of sturdy tubular steel, increases a child's sense of security while learning to stand. • The lightweight Trekkie Poles™ can be attached to the walk-on base or used independently-ideal for the child who is ready to take steps. • The Parallel Bars™ are adjustable in both height and width and can be used as an aid for children developing walking skills such as stepping with correct length and width. • The anti-slip Walk-On Base™ has multiple fastening points to secure the various By-Myself parts. • The All By-Myself System™ includes a lightweight carrying cart for easy transport. Please refer to this Link for purchasing options.